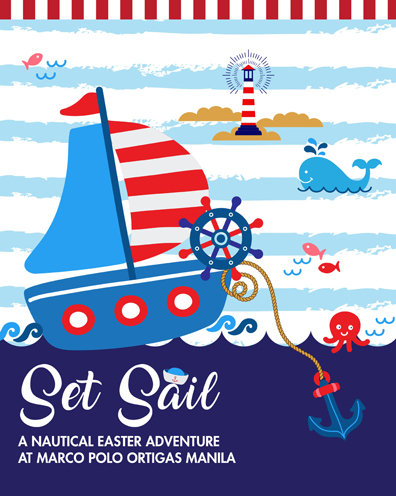 This Easter Sunday, take the kids on a fun voyage across the friendly seas with “Set Sail: A Nautical Adventure” at the Marco Polo Ortigas Manila. Starting at 9 a.m., go on a special journey with a featured magic show as well as arts and crafts activities. Tickets are available at P1,500 per person (kids or adults), inclusive of heavy snacks and a bag full of delightful giveaways. The event is open to the public and will be held at the Grand Ballroom on Level 7. For tickets, please contact the Catering team via [email protected]com or through (+632) 7207777 local 6310. Easter weekend is likewise all the more exciting with a much-deserved staycation at Marco Polo Ortigas Manila. Book an overnight stay from April 20 to 21 starting at P9,900, and get complimentary access to “Set Sail” for four persons. This special promotion package also includes access to the indoor infinity pool and fitness center.